Front Row (left to right): *Ruth Anne Reese (Asbury Theological Seminary), *Amy Oden (Saint Paul School of Theology, Oklahoma City), *Rolf Jacobson (Luther Seminary), *Stephen Ray (Garrett-Evangelical Theological Seminary). 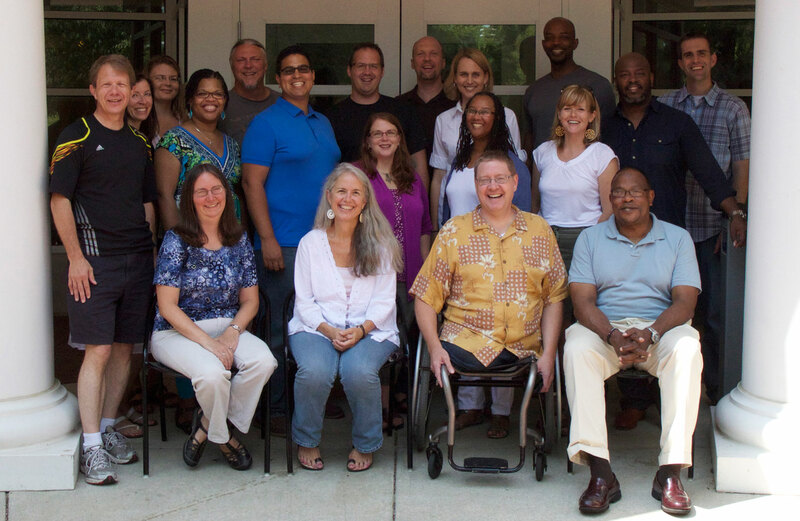 Second Row: *Paul Myhre (Wabash Center), Chanequa Walker-Barnes (Mercer University), Elias Ortega-Aponte (Drew Theological School), Melissa Browning (Loyola University, Chicago), Vanessa Lovelace (Interdenominational Theological Center), Ella Johnson (St. Bernard’s School of Theology and Ministry), Derek Hicks (Wake Forest University Divinity School). Third Row: Amanda Benckhuysen (University of Dubuque Theological Seminary), Meredith Riedel (Duke Divinity School), Randy Woodley (George Fox Evangelical Seminary), Kyle Small (Western Theological Seminary), Ed Waggoner (Brite Divinity School at TCU), Heather Vacek (Pittsburgh Theological Seminary), Reggie Williams (McCormick Theological Seminary), David King (Memphis Theological Seminary).